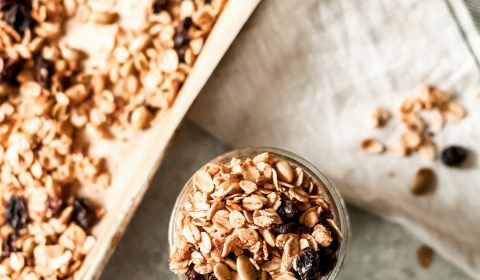 Autumn is just around the corner and I’m craving all the seasonal foods, like this homemade cinnamon and raisin granola. Perfect for topping yogurt, chia parfaits, or just to eat alone as an afternoon snack. First things first, this is a nut-free granola. If you’ve followed my recipes for a while, you’ll know that I have a severe nut allergy. This means that most traditional granola is a big nada for me, so I started making my own a few years ago. With granola, you can get as creative as you want when it comes to what all goes into your granola. 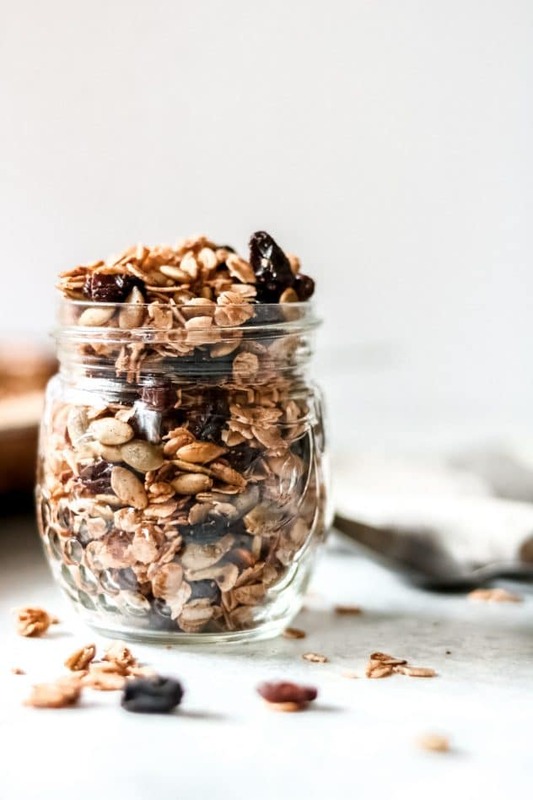 This cinnamon and raisin granola is simplistic, yet perfect for topping your favorite yogurt or building a delicious parfait. 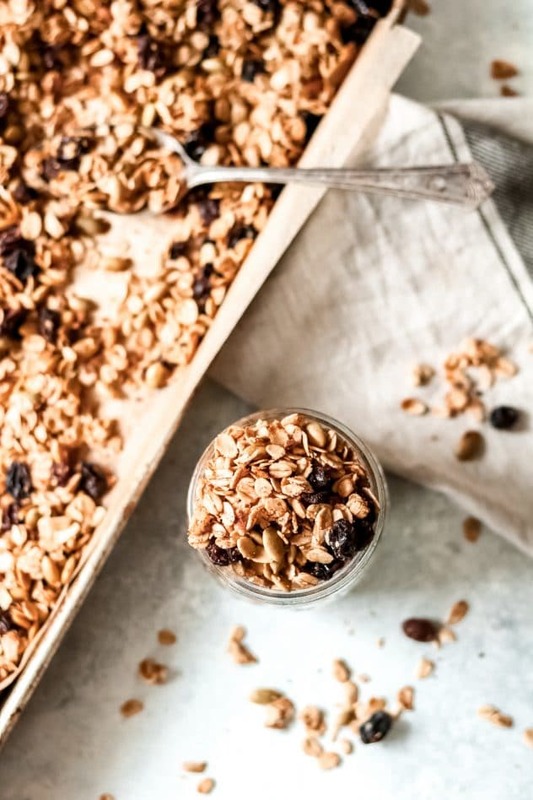 To make this homemade cinnamon and raisin granola, you simply need to add all of the ingredients to a large mixing bowl, lay it out flat onto a baking sheet, and bake. Super simple, and so much cheaper than buying premade granola from the store. 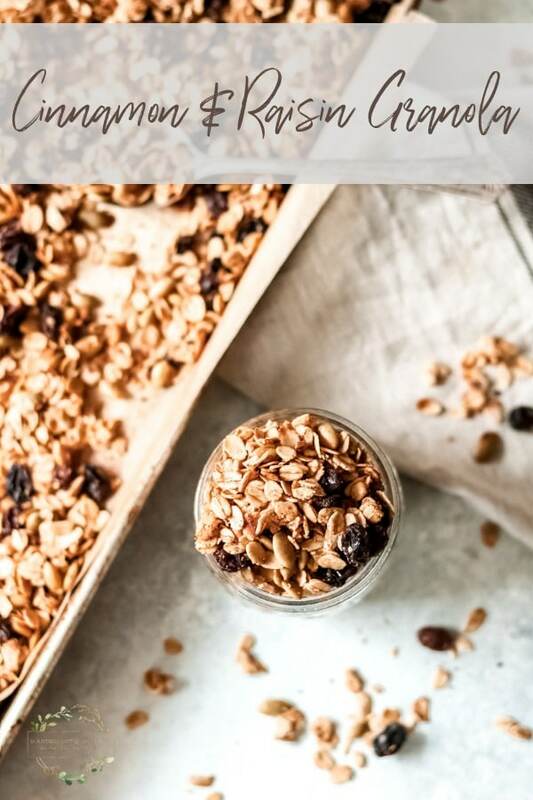 It’s simply a matter of adding the oats, plus any additional items like seeds, nuts (not for me), or dried fruits, spices, oil, and your sweetener of choice. With this granola, I used maple syrup, which is my preferred sweetener. I used this homemade cinnamon and raisin granola in a recent pumpkin chia pudding parfait (which I’ll be sharing the recipe soon! ), and it was delicious. My kids like to eat the granola as an easy snack, too. It’s so versatile. I’ll even eat it in a bowl with milk, or heat it up with milk and let the oats cook, so good as the temperatures start to cool down this season. How do you like to eat your granola? Comment below and let me know! In a large mixing bowl, add all ingredients and stir to combine. Use your hands if needed to get all of the ingredients mixed well together. 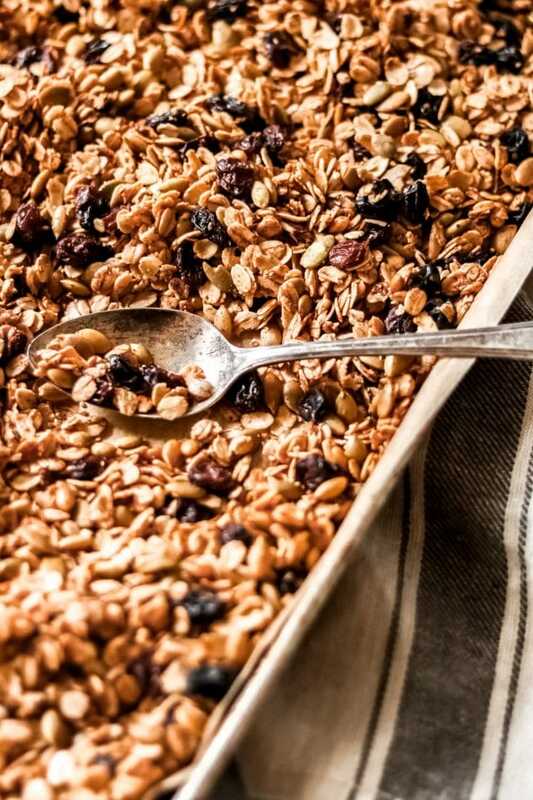 Transfer the granola mixture to a baking sheet and spread out until the entire pan is covered. Bake for 25-30 minutes, or until golden brown. Let fully cool, then store in an airtight container.